Reach 15000 points within 30 seconds to complete the level. This level has easy difficulty and you could make easily million score on this endless level if you play with good strategy and technique. 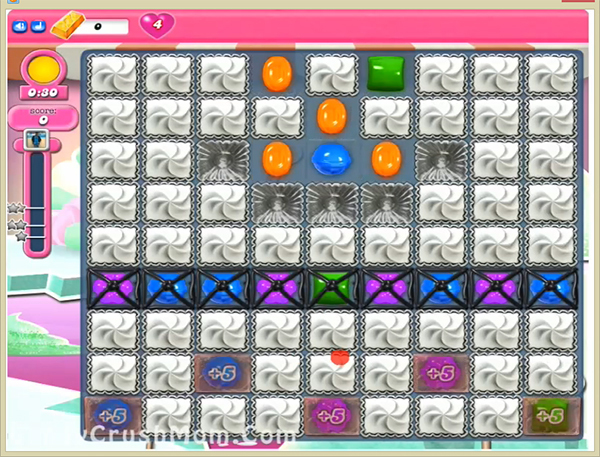 For this level first try to play from bottom and break blockers and try to make special candies. Use striped, wrapped candy and colorbomb with normal candy and don’t use striped candy with colorbomb or wrapped candy as it could waste your time. As you use special candy it will help to get time bonus candies and will let you to play this level till you want. We completed this level with almost million score using above special candy strategy and we let this level end own self to save time.